DALLAS, May 1, 2018 /PRNewswire/ -- Pizza Inn started in 1958, when two Texas brothers opened the first Pizza Inn in Dallas. 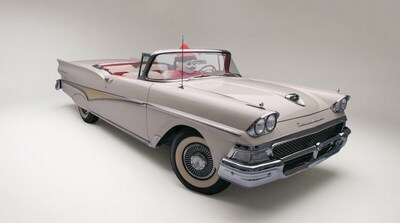 To celebrate 60 years of service, the brand known as "America's Hometown Pizza Place" is giving away a 1958 Ford Fairlane Skyliner hard top convertible to one of its lucky Pizza Inn Rewards members. "We are proud to have served so many loyal fans over the last 60 years and want to give back something extra special," said Denise Pedini, executive vice president of Pizza Inn. "It's our way of saying thank you for being a part of our family for 60 years." On Sept. 23, a winner will be chosen by an independent third party out of a random draw of all current Rewards members. Customers are encouraged to sign up for Pizza Inn Rewards to have the opportunity to win the 1958 Ford Fairlane Skyliner. See pizzainn.com/rewards for official rules. The classic car will be touring across the country to specified Pizza Inn locations from May through September. The tour kicks off on May 4 in Durham, N.C., and will visit cities including Wilson, N.C., High Point, N.C., Goldsboro, N.C., Rocky Mount, N.C., Knoxville, Tenn., Murfreesboro, Tenn., Greeneville, Tenn., Spartanburg, S.C., Greer, S.C., Brunswick, Ga., Baxley, Ga., Pickens, S.C., Shelby, N.C., Frankfort, Ky., Paducah, Ky., Sikeston, Mo., Poplar Bluff, Mo., Grenada, Miss., Greenwood, Miss., Monticello, Miss., Franklinton, La., Lewisville, Texas, Snyder, Texas, Big Spring, Texas, Hobbs, N.M., Carlsbad, N.M., Muskogee, Okla., and Duncan, S.C.
"Exciting things are happening at Pizza Inn and we are thrilled to celebrate with our longtime fans across the country," said Bob Bafundo, president of Pizza Inn. "The car tour is a chance for us to thank guests for their loyalty and to hear stories of how Pizza Inn has been a part of so many memories as America's Hometown Pizza Place." Pizza Inn will also be gifting prizes, such as 60th Anniversary commemorative items and Free Buffets, via social media throughout the year. Stay in touch by following Pizza Inn on Facebook, Instagram and Twitter. The popular pizza chain is known nationwide for its exceptional pizza and friendly service. The restaurant's original pizzas blend everyone's favorite ingredients to create distinctively unforgettable flavor combinations with homemade pizza crust that is made fresh daily. In 1994, Pizza Inn was named the #1 Pizza Chain in the U.S. by Restaurants and Institutions Magazine's annual "America's Choice in Chains" consumer pole. Today, Pizza Inn, as part of RAVE Restaurant Group, operates more than 200 restaurants domestically and internationally. For the restaurant nearest you, and more information on the entire menu, visit pizzainn.com.